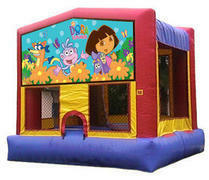 This unit the Original Dora the Explorer bounce house. It is a regular jump house with Dora panel attached to it. Kids have a great time bouncing and exploring with Dora. Excellent rental for girl themed parties.